Sunday roast is a tradition, but make sure yours is the best in town! A good gravy and perfectly roasted meats are vital. Our mash makes it easy to plate up fast without compromising on quality. Preheat oven to 230 degree Celsius. Rub the beef roast with the oil and CONTINENTAL Professional Beef Flavoured Booster. Place on a wire rack in a shallow baking tray and bake for 20 minutes then reduce oven to 110 degree Celsius. Bake for a further 2-2.5 hours until a meat thermometer reads 63-65 degree Celsius for medium cooked. Set aside and rest for 20 minutes before carving. Place the 1.20 L water in a large pot and bring to the boil, remove from heat and whisk in the CONTINENTAL Professional Instant Mashed Potato Mix, until well combined, stir through garlic. Place the water in a large pot and heat. Whisk in the CONTINENTAL Professional Instant Rich Brown Gravy. Bring to the boil, whisk continually. 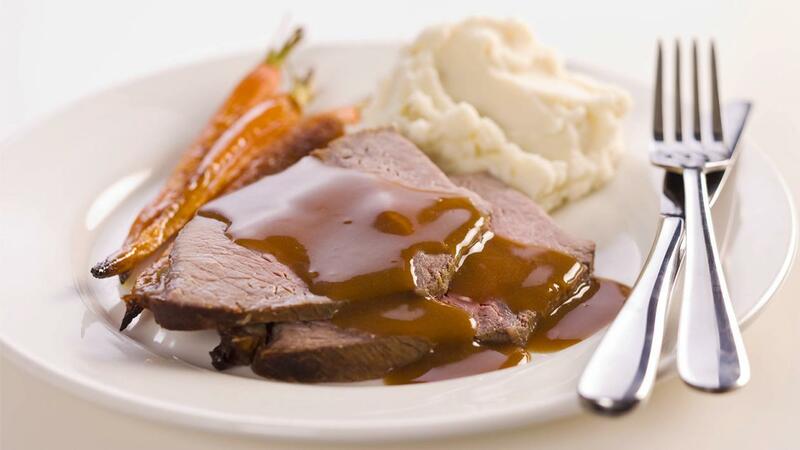 Serve roast beef with garlic sweet potato mash, CONTINENTAL Professional Instant Rich Brown Gravy, and roasted carrots.